Nope, I don't have trouble getting things done and keeping track of my agenda. Heck, that's my job - keeping the business agendas of my seven bosses straight. Yes, I said seven. You can call me Snow White. Nope, I don't have bad intentions or any hidden agendas. I have a problem when it comes to the tangible object called an agenda - otherwise known as a planner, datebook, diary, Filofax, calendar, myentirelifeinanotebook. One of the many things I inherited from my mother is the need to make lists. Lots and lots of lists. For everything. I was the child that sat at the kitchen table and made up to-do's, including but not limited to: "figure out how to draw a giraffe, find a t-shirt to put on Baby Louie (my oversized-Himalayan-inbred-monster-of-a-cat. please note that I had more than one cat named Baby Louie as a child. ), ask Mom if she can make cookies, brush Baby Louie, ***4pm - Home Improvement!" Little did I know that later in life the actual task of making such lists wouldn't be so fun since they involved things like paying bills and buying toilet paper (ya know, to put in the toilet room. heh.) Once life consisted of such responsibility I found myself on the constant search for the perfect system of organizing my life. Some people keep everything stored in their blackberrys, iphones, some type of PDA device -- totally not for me. Somewhere down the line I racked up quite a bit of bad karma with technology (I really need to stop cursing at the printer) and thus, the second I rely completely on any gadget to store my life it will completely die and everything will be lost forever including my sanity. 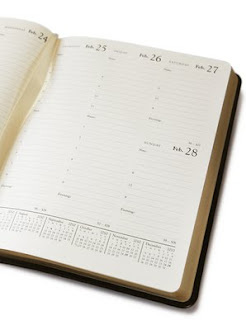 So, I stick to some form of paper calendar - but how do you choose? 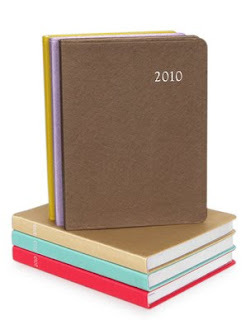 Some are so gi-normous that you end up being the big oaf lugging around a planner that can't even fit in your purse. What's worse? A tiny planner. Like what the hell is THAT going to do? I see women pull out these itty bitty leather squares from their purses as if they're about to perform a magic trick ("watch it disappear between my fingers! "); they force the pages open and attempt to write their list in a miniature box . They can't even fit their palm on the page to hold it down and their fingers crumple up in pain in attempt to write "need milk". Yeah, it's cute. Yeah, it can fit in the inside pocket of your purse. But, can you actually read what you write down? That's what I thought. After years of ditching datebooks & calendars only a few months into a year because they just weren't cutting it, I have finally found one that has made me happy all-the-livelong-year. Voila! You can find these at Kate's Paperie. 9.25"x7"
In addition to monthly views, the planner also shows each week at-a-glance and provides pages for addresses/personal records/expenses and so much more. With plenty of room to keep straight all the million little details life contains, you simply can't go wrong. 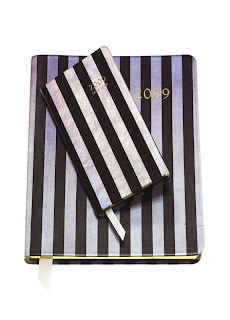 You can also "snazz" it up by purchasing Henri Bendel's special edition of the agenda sold at their store. (Okay, the one on top = tiny planner = dumb purchase that will give you carpel tunnel syndrome. I'm talking about the one on the bottom.) For 2010, they have patent red, a cream patent with a Bendel scene --- and a fabulous black sparkly version - that I may or may not have already purchased. Wink. Agenda problem solved. Crisis averted. New York Cares, Do You?